This day has also been dominated by my use of Greek yogurt, so I’m completely serious when I say you can use it in practically everything you make or bake! I was at the gym this morning, mulling over what I would make for breakfast. I had to drive my dad to and from on a few errands and was not sure how long I would have, but decided another smoothie recipe would be perfect on the go. For lunch, I met up with my my friend and future roommate, Liz, to do some last minute shopping for our townhouse. I hadn’t seen her all summer because she had been working in San Francisco, so it was nice to catch up, but like always, it wasn’t nearly enough time. I introduced her, her brother and his friend to my favorite spot, Lemonade. 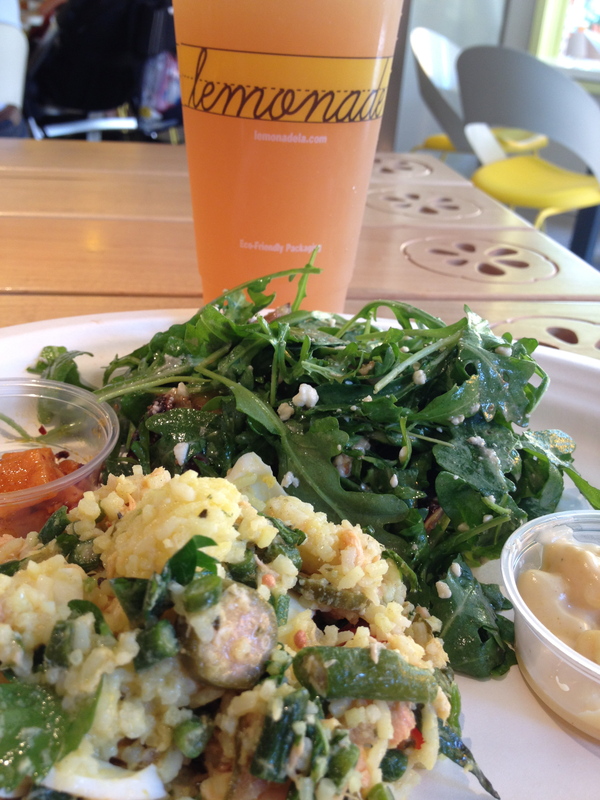 I stuck to my favorite combination – Salad (arugula, blue cheese, figs, and balsamic vinagrette), Seasonal Special (rice/pasta/couscous like, salmon, hard boiled eggs, tomatoes), Arnold Palmer, and a sample of sweet potato salad/mac & cheese. However, before we set out on our shopping spree (well, more of a window shopping adventure where I swear if I hadn’t used an immense amount of willpower, I would have purchased enough to fill up three shopping carts), I made an attempt at blueberry muffins, based off of this delicious looking Blueberry Bread recipe from No Sugar Sweet Life’s recipage. I actually had a tub of Chobani’s (yep, I’m obsessed) Blueberry Greek Yogurt in the house, so this was the perfect recipe to put my yogurt reserves to use. 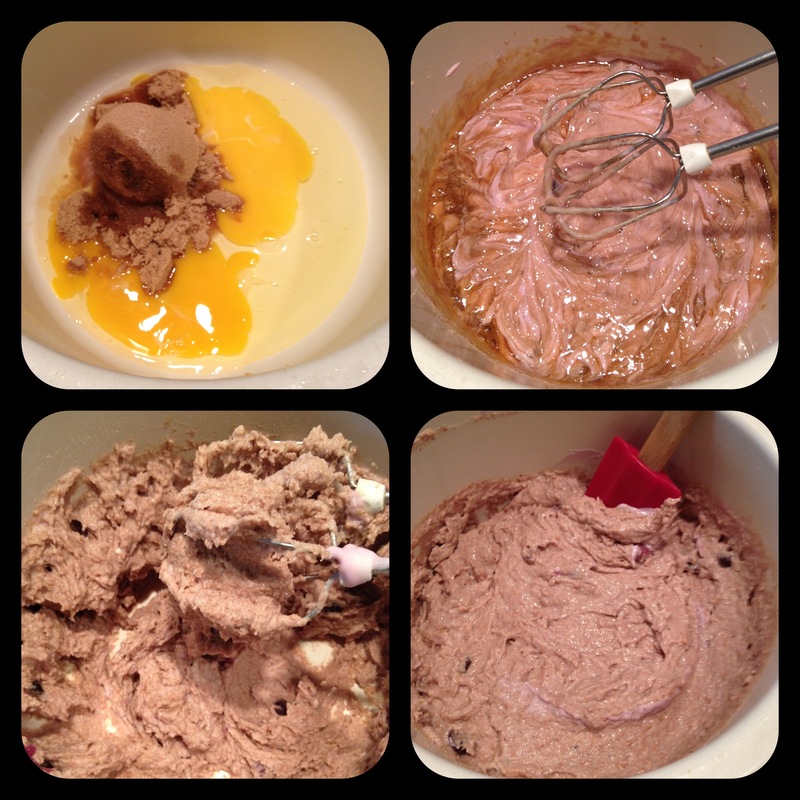 In another bowl, mix the eggs, brown sugar, and vanilla. Slowly add the yogurt & applesauce until mixture appears blended. Add in wet ingredients and finally stir in blueberries. Separate into a muffin tin (you will probably need at least 2 tins) and bake at 350F for about 12-15 minutes (depending on how many muffins are in the tin…affects the temperature) or until a toothpick comes out clean. Now, this recipe was ultimately for my dad, but I doubt he will enjoy them. He tends to enjoy more of the Aunt Jemima muffins and will turn his nose up at a number of my healthier recipes. Yes, they didn’t seem to come out as light and fluffy as I would have liked, so I will attempt to turn that around. 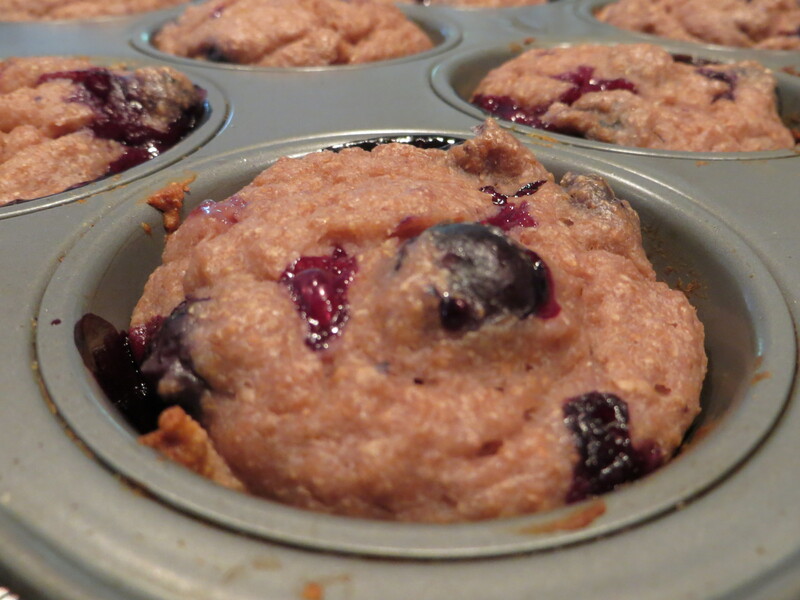 For now, we can just enjoy the dense blueberry muffins with healthier ingredients and ones full of protein. Fast forward a few hours and let’s review dinner. Baking and experimenting seemed to be in today’s agenda and dinner was no different. It is the last night that my mom has as her sous chef. All summer, my sister and I tended to dominate the kitchen, so I don’t know what she and my dad will do when I leave. Maybe I should pack up some “Dream Dinners” or frozen meals to zap in the oven or microwave. Just kidding, my mom is an awesome cook, just I understand how exhausting it can be after a day of work. I had been packing for school most of the afternoon, also a tiring task, but I was up for the challenge of dinner. Speaking of packing, I seem to have filled my car with bags of clothes and crafting materials (just so I am not bored, right?) 😉 but have NO idea how this will all fit in my room or even make it home at the end of the year along with the 6 other boxes already at school. Optional: spinach, ham, sausage, bacon, chicken, etc. Preheat oven to 350F. Place a pre-made pie crust into a pie pan and pinch in the sides. Chop up the vegetables and add them to a bowl with the eggs and 1.5-2 cups of cheese. Pour into the pie pan and top with shredded parmesan cheese. 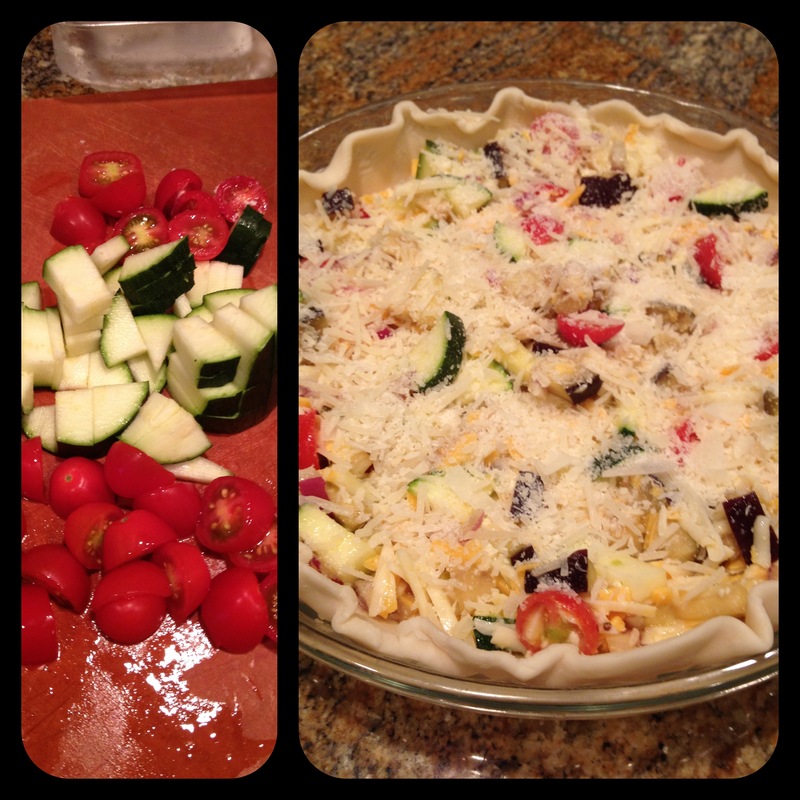 Place into the oven for about 30-40 minutes until the top and crust has sufficiently browned. 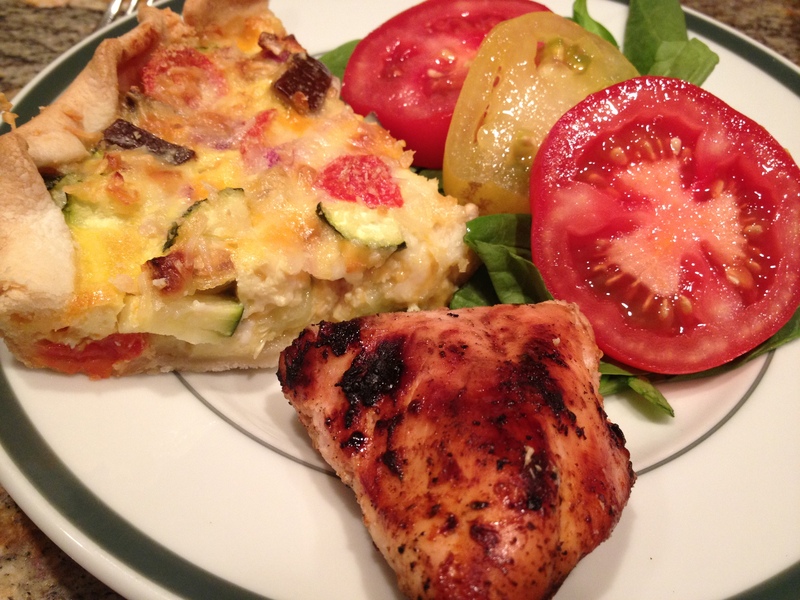 Allow quiche to cool and then serve with a bed of spinach, tomato, and a few slices of chicken. 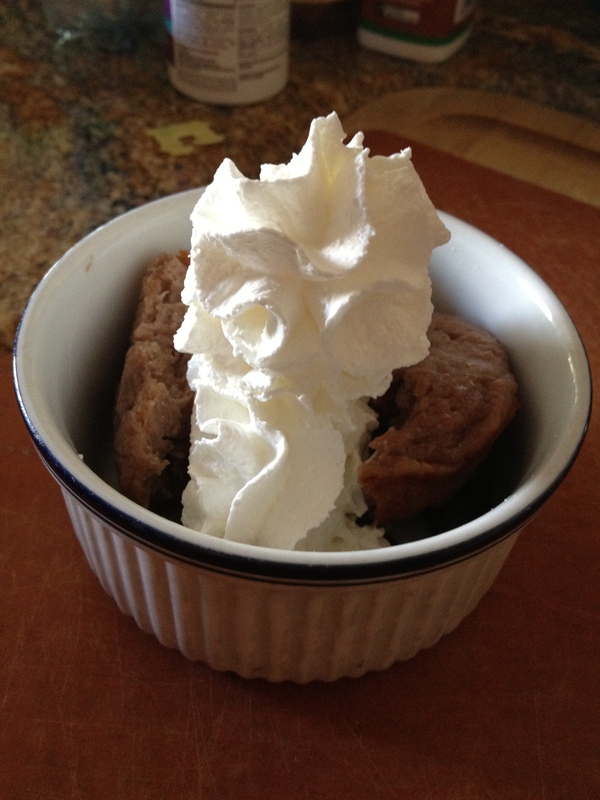 In my last WIAW post, I wrote that I was going to try to consume less sugar, at least the refined sort. Everything in moderation, but I have been better about this and have discovered a few ways of making dessert. One of my friends re-introduced the idea of Cool Whip on berries and fruit, which is indeed possible, but honestly, for someone with an uber sweet tooth, doesn’t quite hit the spot. 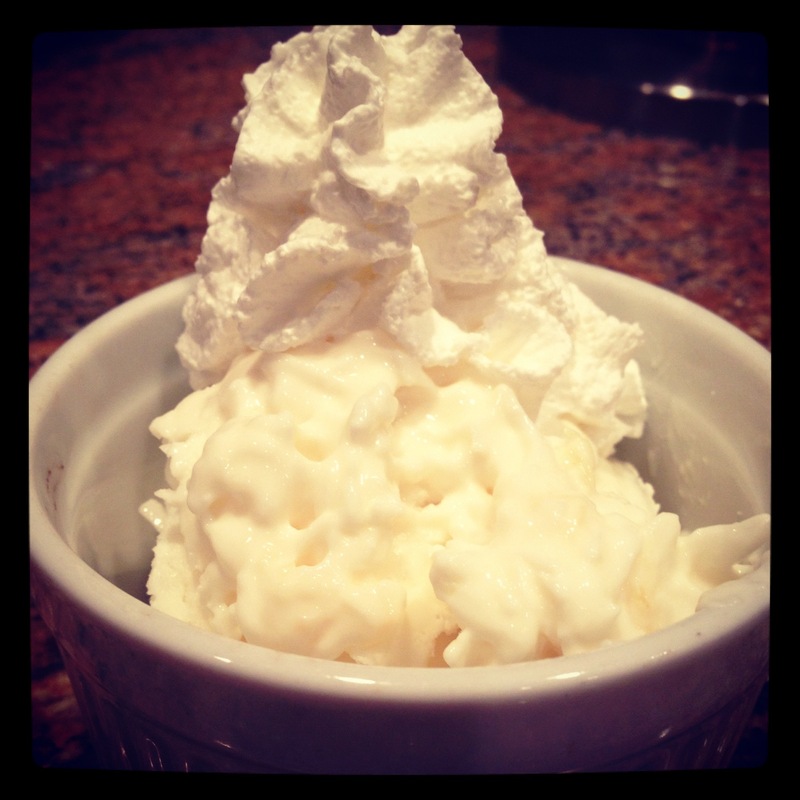 Instead, I’ve found a healthier way to make the ultimate dessert – ice cream! 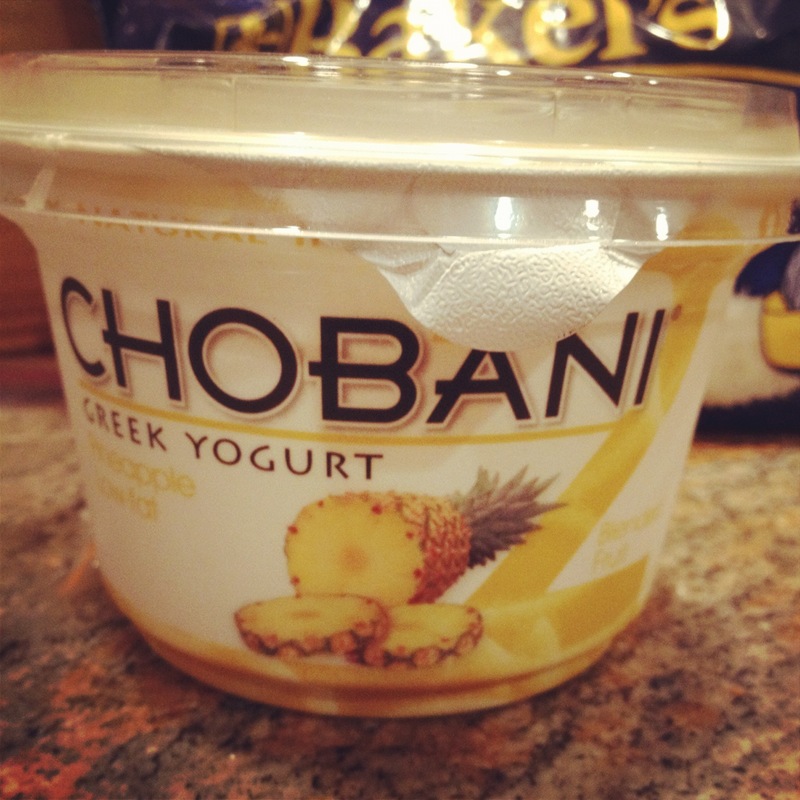 This was also inspired by Chobani’s new blended flavors. I picked out pineapple and decided to whip up a coconut pineapple ice cream, probably one of my top choice flavors. *The great thing about the 16oz sizes is that it comes with a replaceable lid, allowing you to use part of the yogurt now, then place it back in the fridge for later! 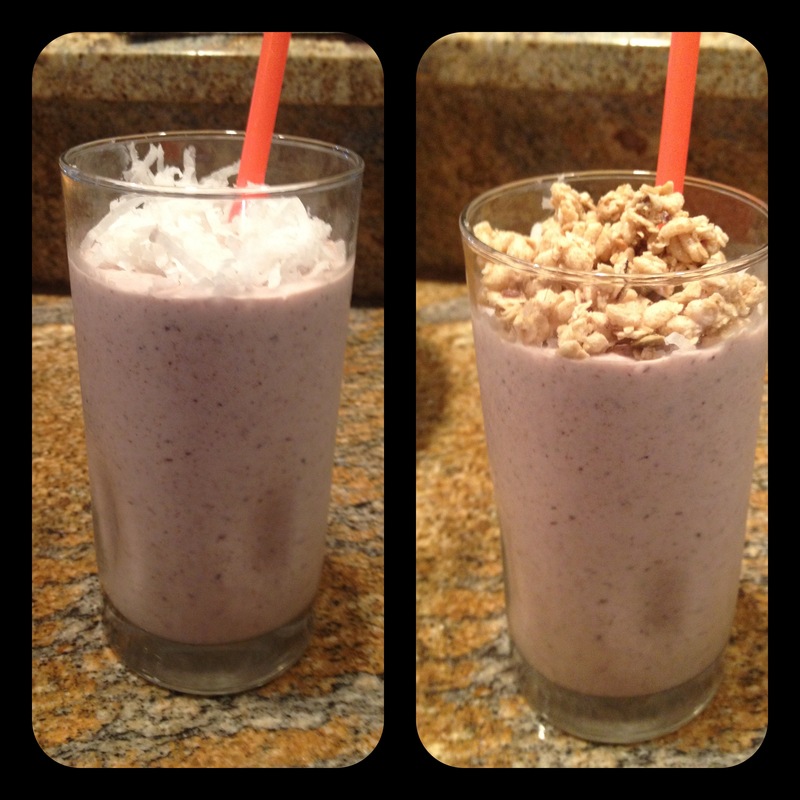 Almost There: Take the container and mix in about 1/3 cup coconut into yogurt. Place the container back into the freezer for about 1-2 hours. The less time in the freezer produces more of a soupier frozen yogurt consistency. Obviously, having it sit in the freezer for a longer period of time will create the thick and icy consistency that is practically similar to Haagen-Daaz. “Practically” is just fine by me, especially when it doesn’t require an entire ice cream machine appearance, provides me with extra protein, and has an extensively lower amount of sugar than other ice cream varieties do. 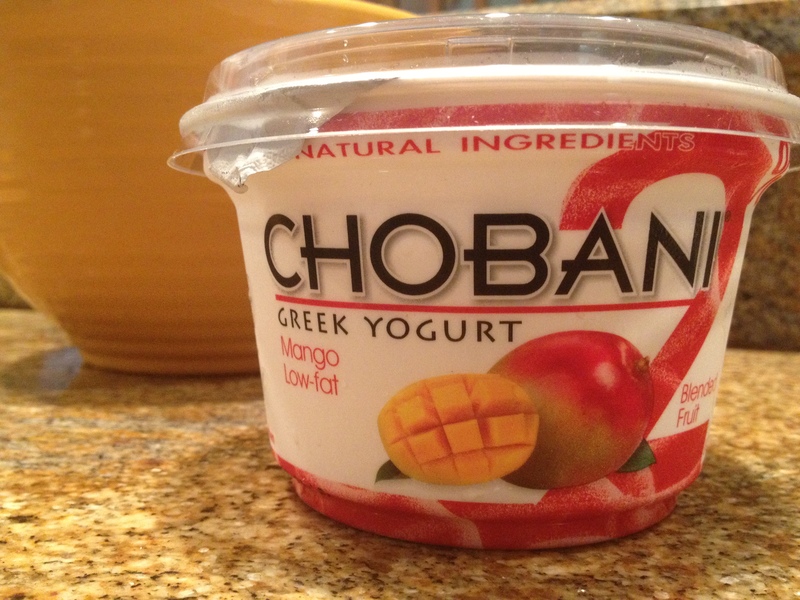 In addition, Chobani makes a number of other tasty flavors, full of fruit or even chocolate-chunk, that would make a great ice cream treat. 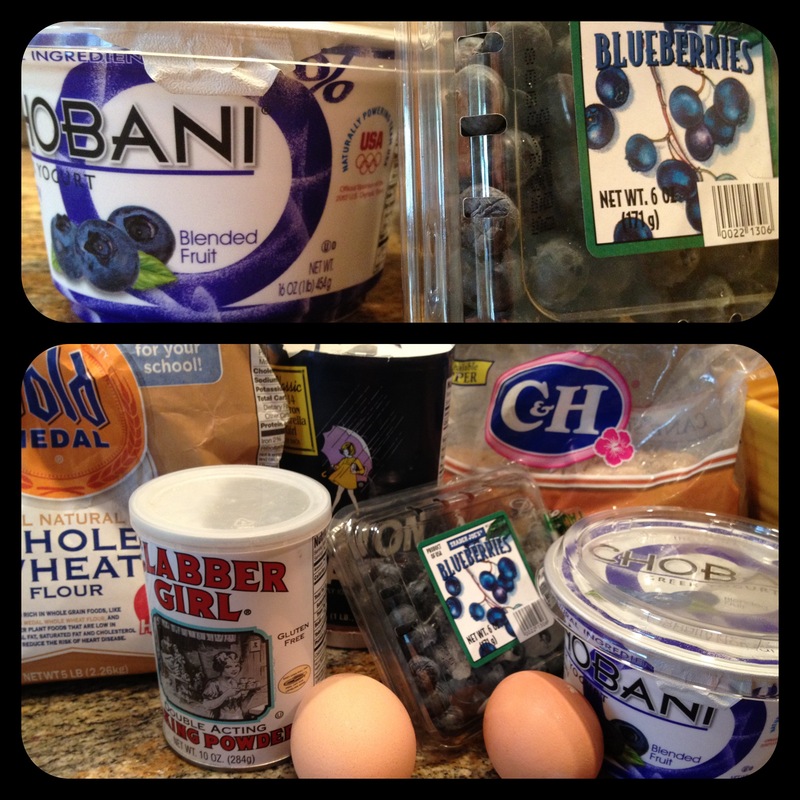 This entry was posted in Fall, Recipes Galore, Summertime and tagged blueberries, chobani, eggplant, fruit, ice cream, muffins, pineapple, quiche, smoothies, vegetables, WIAW, zucchini by Kaitlin. Bookmark the permalink.